At Canarias.com we are pleased to offer you a premium class car rental service for weddings and special events, available with or without driver (subject to availability). Thanks to our great experience, we can turn your special event into a magical and unforgettable memory for all its participants. 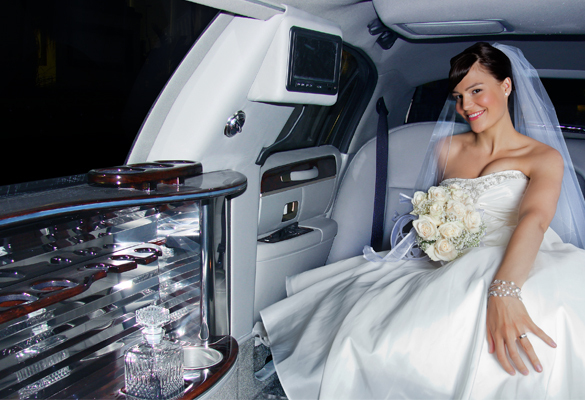 On the wedding day, the bride will arrive in a fantastic limousine and, once the service is over, we will continue to accompany the bride and groom to the photocall and afterwards to the banquet. On board the limousine, they will enjoy a toast with cava. Among the special services that you can add there are the possibility to personalize your wedding car with the names of the bride and groom, decorate it with beautiful natural flowers, enjoy the bar service and chocolates, or any other idea that you want to make a reality this day. We can also take care of the transfer of your guests, so that you can enjoy your special event fully and without any concern. Contact us now, to get the best price for your wedding car! If you need an individual transfer for any other special occasion such as a bachelor party, anniversary, birthday, romantic trip, a party with friends or else - do not hesitate to request your quote by mentioning all your preferences and we will make it come true. * The service will include a bottle of Cava. Other options depend on availability and price. ** Red carpet. As long as the surface and space permit its placement. *** Decoration, which would consist of tulle ties that we would place in the back doors, these would be standard, and therefore the colour cannot be chosen. Our services are either quoted hourly, or from one given point to another, not including waiting times for the latter. For these types of events, our recommendation, is to choose hourly services given that the itinerary may suffer changes in timing for unforeseen reasons and considering possible waiting times. Having said this we would require, to the best of your knowledge, the approximate itinerary, pick-up & drop-off times and any special requests you may have on route. - The quote is for the vehicle indicated, if the number of passengers where to increase, we would change the quote based on the new vehicle required. - For limousines, the maximum capacity is for four passengers. (Law 148/1994, of 15th July). - The service will be carried out in the vehicle and colour requested, however if for reasons beyond our control, such as a break-down, said vehicle/colour is not available, we would supply a vehicle of similar characteristics and/or colour. - South Tenerife. The pickup & drop off point must be in the South. Other areas please ask for availability and pricing. - The quote will be based, originally, on day time hours, pending final details. - The duration for hourly trips starts from the pickup point and ends at the drop off point. Maximum time allowed is 4 hours. Once the established finishing time has been surpassed, “hourly additional charges” will be incurred subject to the availability of the vehicle. (Please see additional charges). - Any itinerary may be changed, by the client, if it complies with the timing and area originally agreed. If the trip requires more time than originally foreseen, the client may extend the trip, subject to availability, paying the additional hourly charge. (Please see additional charges). - We have vehicles available for your guests, if required. (See different types of vehicles). - The VIP service includes a bottle of Cava. Other options subject to availability and quote. - Red carpet option, subject to the place and conditions permitting its instalment. - Decoration, if laid out by us, would consist of tulle ties that we would place in the back doors, these would be standard, and therefore the colour cannot be chosen. If you wish to have your own decoration you must take into account that the adhesive, if required, must not damage the paintwork of the vehicle. - The request of services to Bahía Cars, S.L. by means of any of the channels available, implies that the client accepts the terms and conditions of our, service agreement, as well as the responsibilities derived thereof. - Bahía Cars, S.L. is responsible in taking the passengers to the previously designated point. - Bahía Cars, S.L. cannot be held responsible for any restriction/delay that may arise on route or at the final destination, or that pertaining to any service not rendered directly by Bahia Cars S.L. - The passenger must be aware of the pick-up procedure whether from an airport or a private address, (street, number, door etc. ).